If you are looking for ways on how to cook potatoes you will find that they can be boiled, baked, fried or grilled. This is one vegetable that our home was never without; both when I was growing up and after I had my own home. Mom use to say “you can make a meal if you have potatoes”. Potato recipes were included in every meal when I was young. Although the price of potatoes has risen through the years, it is still one of the most economical foods to eat. The bulk of the potato quickly fills the hunger. The potato is also one of the easiest vegetables to store. 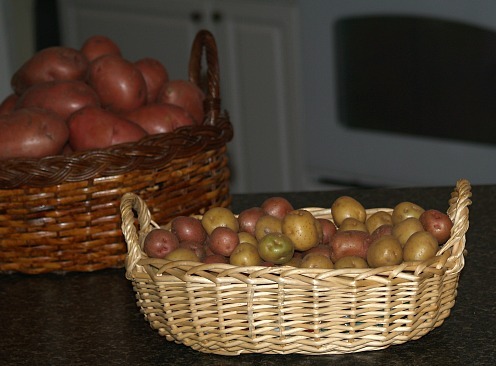 If kept in a cool dry place, the potatoes will keep, having a lower rate of spoilage. Don't forget to try the sweet potato if you learn how to cook potatoes it can be eaten plain or made into a fabulous dessert or side dish. Many want to blame the potato for additional calories in their diet when the calories actually come from the additional ingredients added to the potatoes like when you make mashed potatoes. If you know how to cook potatoes, you know they can be loaded with calories or can be served baked plain. They are actually very healthy and also good for you when trying to lose weight. The potato contains many vitamins and minerals. A woman I know could not lose weight and her doctor told her to add a potato to her diet; it boosted her metabolism and gave her energy to where she began losing the weight. I experienced a couple of times in my life after eating out, a sickness. My doctor thought it could be a food poisoning. He told me if I had to eat out order a plain baked potato most restaurants know how to cook potatoes; if served hot, it is about the safest food to eat. Although potatoes are often baked in a microwave, I prefer to bake them in a conventional oven or for cookouts with the grill. I usually buy very good baking potatoes at Sams or Costco Wholesale stores, unless I can find large ones at the farmers markets. When learning how to cook potatoes you will find types of potatoes like the Russet potato are more suitable for baking because of the size and texture. Prior to cooking a baked potato scrub it thoroughly removing any blemishes on the skin. I vary a little the way I cook baked potatoes, depending on my mood; no specific reason. Sometimes before wrapping in aluminum foil, I roll the potatoes only in melted butter or olive oil. Other times I roll in melted butter and then cover with coarse sea salt before placing in a regular oven to bake. The foil keeps the potato moist and makes the skin soft. There are times that I just throw the scrubbed potatoes in a baking pan without the foil and bake plain. Sometimes I roll them in olive oil and maybe salt and place in a pan in the oven and bake. Baking without the aluminum foil makes the skin crispy. Sometimes I prefer this crispy jacket. When cooking out for a barbeque, I always wrap the potatoes in aluminum. I do have a purpose in this procedure. I have found it produces a much better potato if cooking on the grill rack or (and especially) in the coals. In the coals, the foil keeps the moisture in the potato and helps to keep the potatoes from burning to fast on the outside while the inside is still uncooked. Grease a 1 ½ quart casserole dish. Mix all ingredients except for the onion rings on medium speed for 4 minutes. Spoon mixture into casserole dish and top with the crushed onion rings. Dump in prepared pan and spread out evenly. Top with parsley and paprika. Place cubed potatoes in a saucepan; cover with water; cook until tender; drain. Cook peas according to directions adding the sugar. Combine peas with the cooked potatoes. Melt butter in saucepan, add flour, salt and pepper; Stir in milk. Bring to a boil and cook until mixture thickens. 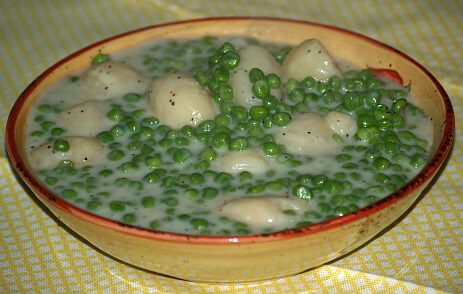 Pour boiled mixture over the peas and potatoes; Stir and serve. Brush, wash and dry potatoes; cut into 1 inch slices. Process onion soup mix in blender until fine; sprinkle over top of layer of potatoes. Make another layer of potatoes; sprinkle again with onion soup mix. Do a third layer and sprinkle again with onion soup mix. Cover tightly and bake in preheated oven at 350F degrees for 2 hours. NOTE: These can be prepared ahead and reheated. Knowing how to cook potatoes for a crowd can make many economical dishes. Place potatoes and garlic in large saucepan; cover with water. Bring water to a boil; cover and cook about 20 minutes until tender. Drain potatoes and garlic; return vegetables to the saucepan. Beat with hand mixer until combined; add cheese, butter, rosemary and bouillon. Beat mixture until smooth; gradually beat in milk until fluffy. Season with salt and pepper; garnish with addition rosemary sprigs if desired.